Download - The fact sheet. On Thursday, February 28, Republicans in the Alabama House and Senate passed historic education reform that will help ensure every child in Alabama, no matter their zip code or station is life, has access to a quality education. Thank you so much for your support of the Alabama Bass Trail and the partnership with the Alabama Student Angler Bass Fishing Association. Your contribution will go to fund a number of conservation service hours grants to well deserving high school anglers. The video that I am including was shot during the conservation project we completed on Smith Lake on August 15th. We will planning similar projects like this in your area. Thank you again for your support and I look forward to sharing more exciting news with you soon. The new law will limit the civil liability of a contractor for work performed on a highway, road, bridge or street, including repairs, construction or maintenance on behalf of the Alabama Department of Transportation (ALDOT), the county or local government, unless it is shown by a preponderance of evidence that physical injury, property damage or death is caused by the contractor’s performance or inability of the contractor to recognize a dangerous condition. The “Heroes for Hire” Tax Credit Act, House Bill 152, sponsored by Rep. DuWayne Bridges (R-Valley), passed unanimously by House and Senate, sent to the Governor for signature. With wars winding down in Iraq and Afghanistan, thousands of Alabama veterans will soon return home to a difficult economy in which it is hard to find a job. This proposal would offer Alabama businesses a $2000 tax credit for hiring a veteran recently returned from war. Aviation and Aerospace Economic Incentives, House Bill 39 sponsored by Rep. Paul Lee (R-Dothan), passed by the House, amended and passed by the Senate, pending House or conference committee action This bill would provide for a special tax incentive allowing Alabama to target aircraft manufacturers and aircraft parts manufacturers. Enhanced Incentives to Recruit Job-Creating Coal Mining Projects, House Bill 144 sponsored by Rep. Bill Roberts (R-Jasper), passed by House and Senate, signed by the Governor. This bill enhances the state’s ability to recruit coal mining companies by allowing them to qualify for certain existing tax incentives currently available to manufacturers and other businesses. Alabama has long trailed behind in the film and television production industry because our state lacked the incentives other states have to help attract these job-creating productions here. A 2011 law that included television productions in Alabama’s film incentive has already rendered great success as the popular shows “Rocket City Rednecks,” “Big Shrimpin’” and “Sweet Home Alabama” all based their productions in Alabama. This bill would expand Alabama’s film/television production incentive cap from $10 to $15 million, making Alabama more competitive in the industry. The bill would also double the amount productions could spend and count toward tax incentive rebates from $10 million to $20 million. This would help Alabama attract larger productions that will in turn create more jobs. The Alabama Data Processing Center Economic Incentive Enhancement Act, House Bill 154 sponsored by Rep. Dan Williams (R-Athens), passed by House, passed by Senate Committee, pending action by the full Senate Data processing centers are key components of the 21st century economy. These centers employ a skilled workforce, provide high-paying jobs, and have a low environmental footprint. Alabama is uniquely positioned to compete for jobs in this growing industry. This proposal would expand the scope of certain tax incentives in order to focus on recruiting more data processing centers to Alabama. This constitutional amendment (HB 159) would allow voters to give the Governor and the Alabama Development Office more flexibility in offering tax incentives to land major economic development projects and retain companies that might otherwise relocate outside Alabama without having to call a special session of the Legislature. The corresponding enabling bill (HB160) sets strict parameters for how incentives can be used to ensure return on investment. This Constitutional Amendment would repeal the 2007 pay raise and allow voters to determine legislative pay at the ballot box. The amendment also repeals automatic cost-of-living adjustments passed in 2007. This bill would help educators customize schools for the needs of their students by allowing school systems to seek flexibility from burdensome state laws and regulations and establish public charter schools. Currently, anyone may retire with 25 years of service, no matter how young they are. Or, they can retire at age 60 as long as they’ve served for 10 years. This plan sets a minimum retirement age of 62 for most employees, saving the state more than three billion dollars over 30 years. For law enforcement, the minimum retirement age would be 56. These changes do not affect current employees or retirees – whether they’re vested or not. This will only be for new employees hired beginning in 2013. This bill would prohibit driving a vehicle on an Alabama highway or street while using a wireless telecommunication device to write, send or read a text-based communication, including email. House Bill 357 updates and modernizes language in Article 12 of the 1901 Alabama Constitution dealing with private corporations, railroads and canals. House Bill 358 updates and modernizes Article 13 dealing with banks and banking law. This bill would encourage economic investment and job growth in low income areas by leveraging available federal tax incentives with new state tax incentive offerings. In exchange for their investments in qualified businesses and projects located in low-income downtown areas throughout Alabama, the state will offer investors a future tax credit. Investors could claim a 50 percent graduated tax credit over the course of seven years for investments up to $240 million. The credit is zero for the first year and 8 percent for each of the next five years, the ten percent the seventh year. This bill sets a perimeter of 1000 feet, or two blocks, for any disruption of a funeral in Alabama. Currently Alabama’s “move over” law requires drivers to vacate the lane closest to public safety vehicles parked on a roadside. This bill would ensure that service vehicles, such as utility trucks and wreckers and the workers that drive them, are also protected by requiring drivers to slow down and move over to allow them room to work safely. In addition to traditional drugs, synthetic drugs known as “spice” or “salts” have become an increasing problem in Alabama. Updates to the law are necessary to allow law enforcement officers to crack down on such substances and protect Alabama neighborhoods from the latest manifestations of drugs. Under this bill, anyone who possesses, manufactures, delivers or traffics one of these synthetic cannabinoid-like substances would be guilty of a felony and subject to fines ranging from $50,000 to $250,000 and a minimum prison term of between three years and life depending upon the amount of drugs involved. Rewarding Teacher Certification, House Bill 251 sponsored by Rep. Jay Love (R-Montgomery), passed by the House, passed by Senate committee, identical bill already passed by the Senate This bill sets aside $2.3 million in a conditional appropriation to fund a $5,000 bonus for teachers who become national board certified. In Alabama we want excellent teachers in every classroom preparing the next generation of Alabamians to be our greatest yet. Supporting our teachers in their pursuit of national board certification helps us make that a reality. Reorganizing ALDOT to Ensure Accountability, Responsiveness, House Bills 355 and 402 sponsored by Rep. Mac McCutcheon (R-Capshaw), passed by the House, pending committee action in the Senate House Bill 355 would alter the organizational structure of ALDOT by giving the Transportation Director the authority to appoint three deputy directors to help oversee the operations of the Department. House Bill 402 would specifically change the position of Chief Engineer from a merit system position to an appointed position. Adding up to three deputies to help oversee this process and designating the chief engineer as an appointed position will translate into more accountability and responsiveness from the Department. For more information, contact Communications Director Todd Stacy at 334-353-0929. 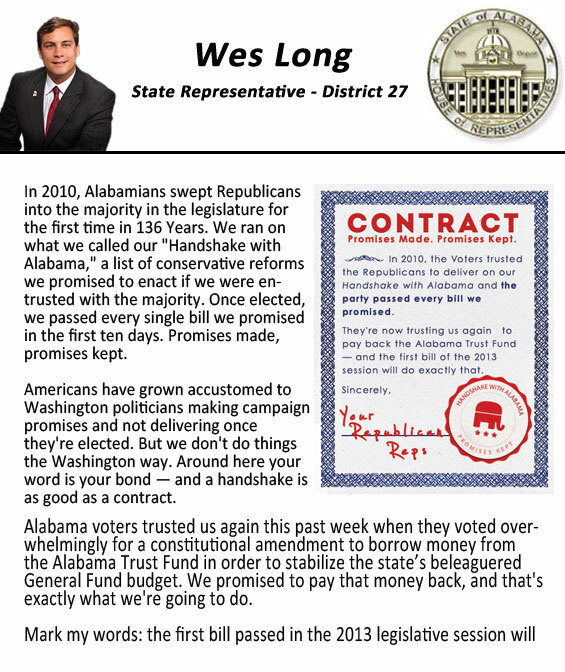 Guntersville– Representative Wes Long does not plan to accept the legislative pay increase which automatically takes effect each year. In 2006 when the state legislature passed the 62% pay increase, Long says that the Democratic controlled legislature at that time also included future automatic cost of living raises based on the Consumer Price Index. The raise is scheduled to take effect in April. Legislators are trying to address the pay issue and hope to have a constitutional amendment that will let the people decide from now on. Guntersville, AL – Marshall County District Judge Hugh Flanagan today announced the formation of the Marshall County Volunteer Mediation Program. The Volunteer Mediation Program is aimed at improving the legal process for child custody cases, by giving families an alternative to a traditional trial. “Child custody cases are often very difficult for the families involved, especially the children. The Volunteer Mediation Program will give families another option through which to settle their disputes. Our hope is that through the optional mediation process, children will be spared from the often adversarial and damaging process of a traditional custody trial,” stated Judge Flanagan. The Marshall County Volunteer Mediation Program will be funded through a state grant secured by the Marshall County Legislative Delegation and run jointly by the Marshall County Family and Visitation Center and the Marshall County Retired Senior Volunteer Program (RSVP). “As a lawyer in the community, I see this as a step in taking some of the burden off the court system. In economic times such as this, it is important to make the courts more efficient and local retirees can be a valuable resource in that process,” said Representative Wes Long. The Marshall County Visitation and Family Center’s mission is to strengthen families through agency programs. The Center provides parenting classes, fatherhood initiative classes and a supervised visitation program that provides a safe and conflict free environment for children to visit with their non-custodial parent. The Marshall County Visitation and Family Center provides services through the following programs; Visitation Program, Fatherhood Initiative Program, Mediation Program, Child Abuse Prevention awareness program, and Co-parenting classes. The majority of these services are provided through court mandated referrals. Marshall County RSVP is a non-profit organization established in 1972, that utilizes the vast talents of older volunteers willing to share their experiences, abilities and skills through community agencies and non-profit organizations in response to a wide variety of community needs such as education, community and economic development, health, nutrition, public safety, environmental, and human service needs. Prior to becoming Marshall County District Judge in March of 2011, Judge Hugh Flanagan practiced law in Guntersville at the law firm of Long, Flanagan, & McDonald. He and his wife Jessica have two children, Conner and Carlyle Grace, and attend Guntersville First United Methodists Church. MONTGOMERY – The dramatic decline in Alabama’s unemployment rate shows that the state’s strict immigration law is helping more Alabamians find jobs, House Majority Leader Rep. Micky Hammon (R-Decatur) said today. Gov. Robert Bentley announced Friday that Alabama’s unemployment rate for October was 9.3 percent, down from 9.8 percent in September. In Marshall County, a known hotbed for illegal immigrant labor, unemployment was at 8.1 percent for October, down from 8.8 percent in September and 10 percent in June, when Alabama’s crackdown on illegal immigration was signed into law. Other counties where illegal immigration has been a problem saw precipitous drops in unemployment as well, including Morgan County, where the rate declined a full 1.1 percent from September to October. Though opponents of Alabama’s immigration law have done all they can to discredit its economic benefits, the numbers tell a different story, Rep. Hammon said. The numbers are in and a significant drop in Alabama’s unemployment rate has lawmakers satisfied that the passage of what has been termed “the toughest immigration bill in the country” is having its intended effect. Alabama’s unemployment rate dropped by half of a percentage point, to 9.3% for October. This is the fourth consecutive month that the state’s unemployment rate has decreased. In Marshall County, the rate is lower than the state average. Every county in Alabama reported a decline in unemployment, a positive sign for economic recovery. Representative Wes Long believes today’s report is only one indicator to the country that the new immigration law is working and giving the people of Alabama job opportunities. “These numbers show proof that Alabamians are filling the jobs. It is one step in creating jobs for legal Alabama citizens and putting Alabama back to work. We must continue to take regulations off small businesses, give tax incentives for investment and expansion, and quit giving people a check to stay at home and not work. I expect to see many states following our lead this year with similar illegal immigration legislation,” Long said. MONTGOMERY – The “Made in Alabama” Job Incentives Act, which authorizes the use of innovative tax incentives to recruit international companies to Alabama, received final passage by the Legislature on Thursday. . The House sponsor of the bill, State Representative Barry Mask (R-Wetumpka), said he was proud to work in a bi-partisan manner to pass legislation that can bring jobs to Alabama. House Speaker Mike Hubbard (R-Auburn) formed the Commission on Job Creation in February, tasking the select group of business and community leaders to gather ideas that could help improve the state’s business climate and boost private sector job growth. Offering temporary state income tax incentives to offset build-up phase tariff costs for international companies bringing jobs to Alabama was among the nine policy recommendations outlined in the Commission’s final report. Speaker Hubbard thanked Representative Mask and Senator Keahey for working together to pass this worthy proposal. Senator Keahey said the Legislature’s commitment to working across party lines to pass this bill proves that job creation isn’t a partisan issue. Senate President Pro Tem Del Marsh (R-Anniston) said Senator Keahey and Representative Mask showed great leadership in working together to pass this job creation bill. The Tariff Act of 1930 allows the federal government to impose countervailing duties and anti-dumping duties on imported products, which increases the cost of those imported products to American customers. As a result of the duties, foreign companies with American customers must now consider manufacturing their products in the United States so they will no longer be subject to the duties. Naturally, some companies are looking to establish operations in the United States to manufacture and sell products made by American workers to offset the tariff. However, during the construction and start-up phase, a company has the continued increased cost of paying import duties because the products continue to be manufactured overseas, which puts their customer relationships at risk. Ultimately, a company risks building a new manufacturing facility only to have lost its customers due to the higher costs from the duties passed on to the customer. This risk creates hesitancy for some companies to decide to locate in the United States. Due to changes in global business conditions, there is a significant uptick in companies interested in foreign direct investment in the United States, which has created tremendous opportunities for Alabama. Accordingly, if Alabama had the ability to mitigate the risk for the company that is subject to the tariff during the period of its project build out and start up, the state would have a competitive advantage over other states in recruiting these companies. The “Made in Alabama” Job Incentives Act authorizes the Governor and the Alabama Development Office to offer qualifying companies a transferable income tax credit to offset tariff costs as an incentive to create jobs in Alabama. be revocable should the company not meet its threshold requirements or have its federal duties recouped. For more information, contact Speaker’s Office Communications Director Todd Stacy at 334-353-0929 or Pro Tem’s Office Communications Director Derek Trotter at 334-201-5035.